A startling effect. Let us show you the ropes! Three rope loops magically link to form a single circle. Ideal magic for a beginner and a proven classic for professional magicians. Perfect for school assemblies, church services, youth groups, events and kids parties. We've only 5 of these sets - and once they're gone they're gone for good! The magician displays three ropes – one red, one blue and one white. The ropes are tied into three separate loops. They are thrown up in the air and – WOW – they transform into one large tri-coloured rope! Mid-air magic that’s easy to do! These are hand made woollen 'ropes', soft to the touch and lovely to use. They will last many many performances. Given how quick and colourful this effect is, it would make a flashy opener to a children’s show in particular, perhaps set to music. This would help establish that you are the magician, and that you can do unexpected things! Use these to teach the value of team work. Different individuals can come together to form one team which benefits from all their different skills. Of course the patriotic colours make this perfect for any national event such as an international football match or royal wedding. You can use this trick to illustrate the idea of the Holy Trinity – with each rope representing the Father, the Son and the Holy Spirit. You can discuss the three elements and ask the audience which they think is the most important one. Of course, they are all equally important and they all come together to mean the same thing (at this point you throw the ropes into the air and they transform) With a full circle now, you can explain how God’s love is eternal! The perfect illustration for weddings, just watch Paul's video above. Ideal for illustrating any 3 sermon points e.g. Faith, Hope & Love (1 Cor 13:13).. Grab these 3 ropes and within minutes you'll be performing classic rope magic to delight your audiences. Will you find a better linking rope trick? We’re ‘a frayed knot’ so order today! 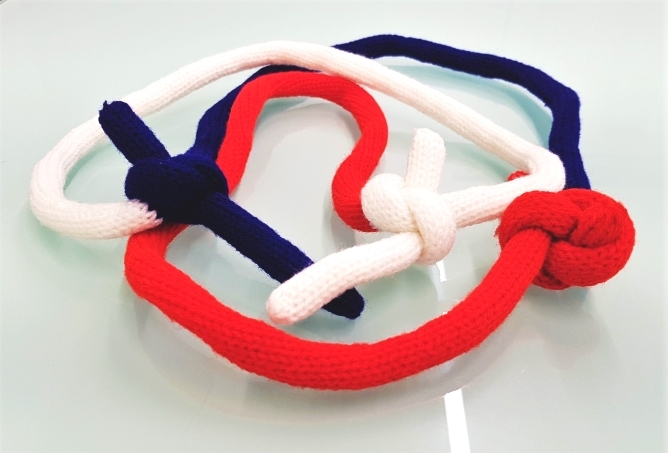 Comes complete with: 3 specially made woollen ropes (red, white and blue) and illustrated instructions. TRINITY Silk Blow - Crystal Tube - Three silks magically join together by blowing then out of a clear tube! Miracle Rabbit - Large rabbit appears from your empty hands!. Easy to do and great fun!